The solution is simple to show the full path in ms-explorer title bar (caption) on Windows-10, for example, to better recognize the current folder location in explorer! Turn on the display of the path in the title bar of MS File Explorer is very beneficial to better recognize in the system tray and title bar what folder it is anyway open. It is a frequently asked question among all Windows 10 system configurations! 1.) ... Activate Path in the Explorer title bar! 2.) ... More tips to the Explorer on Win 10! See also: ► show Program Name in Windows 10 Task-Bar! 1.) Activate Path in the Explorer title bar! Please start the MS-Explorer (Windows-Logo+E) select View open the Folder options. Select the tab View and check the option Display the full path in title bar. 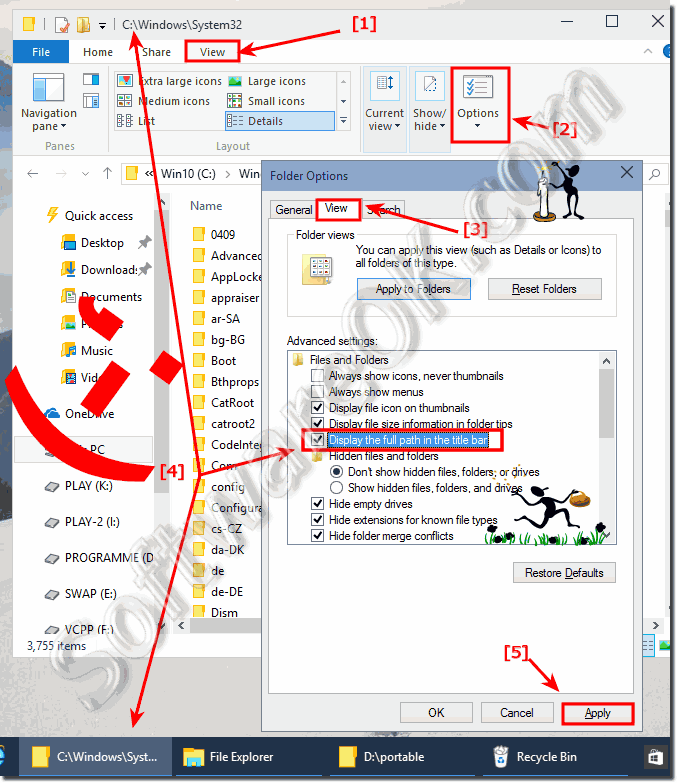 (Image-1) Show the full path in explorer caption bar in Windows-10! The full folder path in the title bar of Microsoft's File Explorer is a handy way to quickly find out which folder you are in. This explanation is for Windows 10 (Redstone 4 & 5), 8.1, 8, 7: Pro, Home, Enterprise, Basic, Premium, Professional, Starter, Ultimate, Windows-Server 2016, 2012, 2008 and can be implemented fairly quickly. You can easily use this easy and fast File Explorers solution on older versions of Microsoft's Windows operating systems, whether it's a Windows desktop, tablet, Surface Pro / Go, or even a server operating system. 2.) More tips to the Explorer on Win 10! ► ... Changing the Startup Directory in Windows 10 MS Explorer (My Computer, Computer)! ► ... auto expand folder in Windows-10 Explorer! ► ... the Folder in the directory tree of the Explorer! ► ... Reset the Internet Explorer settings! ► ... workstation on the desktop of Windows 10! ► ... find an App folder and delete the app! ► ... display file name extension in Windows-10! If you have a lot of problems, you should consider switching to a full version of Windows 10. If necessary, a Windows 10 training is also a useful thing! Or, optional use the ► Q-Dir the Explorer Alternative! Windows-10 - FAQ-40: Show the full path in the explorer title bar on Windows-10!